I didn’t major in a finance degree, nor did I take an MBA in finance to work as a guru in an investment bank. Learning about personal finance wasn’t about schooling or work. It was a choice. Most of the knowledge I have gained was self learned through reading books, educating myself by talking to financial advisers and learning through failure of my own doing. 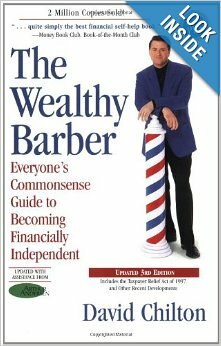 One of the most instrumental books that got me started into personal finance was “The Wealthy Barber”, written by David Chilton. If you follow Dragon’s Den in Canada, then you’d know that David Chilton is one of the investors in the panel sitting alongside popular figures like Kevin O’Leary and Arlene Dickinson, but his fame came from writing this simple book. If you haven’t read it, I highly suggest reading it, as it is extremely simple to follow and easy to understand. It’s one of the books I highly recommend to people who know nothing about personal finance. It’s comes so highly regarded by me that I gifted this book to many family members as a Christmas present in years past. Unlike most books on finance, there is no business jargon or hard to understand terms. This book reads like a high school fiction novel and it teaches you by taking you through a story of 3 individuals that visit a barber shop to learn about personal financial management. Yes, that’s right, a barber teaches personal finance! Though the book reads like a fictional novel, the financial concepts that are outlined in the book are extremely helpful. Even after a decade and half since the book was first published, the material in the book, though dated, is still relevant. If you read the American version of the book it will talk about the 401K, otherwise the Canadian book will talk more about RRSPs for retirement savings. Since this book is so old, the TFSA was never invented for Canadians and thus other material will be required to learn about the advantages of that savings account. If you can still find this book, I highly recommend that you get a copy and read it. As of this review, the book has already been out of print in Canada and the only means of getting a copy is through Amazon US. Don’t be mistaken and buy “The Wealthy Barber Returns”, although that book is more recent and up to date, I still find this one to be the far superior read for a beginner. Many people will never learn about personal finance because they think it’s not necessary for them to learn. More often than not, these are the individuals that get taken advantage of from bankers, insurance brokers and salesmen who are constantly trying to stuff their own coffers through your pockets. These individuals will then lay blame on others for their own failures, or blame the government for being unable to protect them, or perhaps blame greedy corporations from stealing their money. It’s always the same story when you don’t know anything about your own finances. If you don’t want to be ignorant about your own finances, then take that first step and start educating yourself about your own personal finances. That’s the only way for you to start gaining confidence in dealing with your own financial matters.